The Model 20 Double Flare and Swaging machine will consistently produce uniform double flares in aluminum and copper tubing, light wall steel tubing and double walled weld type tubing. The Olsen Model 20 machine produces a double flare that provides extensive safety in coupling and uncoupling of fittings and greater safety with hydraulic and other fluids. Double flares have been accepted by the S.A.E as standard for the automobile industry; the S.A.E. handbook provides dimensional data. 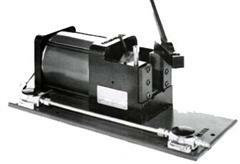 The machine is pneumatically actuated: the cylinder is 6" bore and operates at 70-100 psi. Tooling is available for tube sizes of 1/8": 1/4": 5/16": 3/8" and 1/2". Weight of machine is approximately 165 pounds and is designed for bench mounting. 1. Clamp tube in die opening with clamp handle - first operation tool is tube stop and locator. 2. Depress dual palm valves to produce first stage of double flare. 3. Move tool holder handle to 2nd operation position and depress dual palm valves to complete double flare. 4. Move tool holder handle back to 1st operation position move clamp handle to open position and remove flared tube. This crimper must ship via common carrier. Call us at 800.624.7760 with your Zip Code and we will gladly furnish you with a shipping quote.